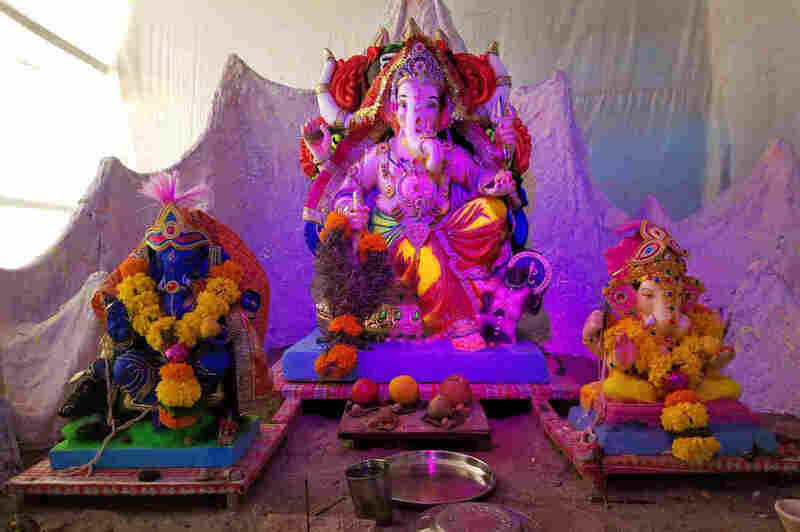 India's Ganesh Festival: Mumbai Parties, Prays For Elephant-Headed God For 10 days, they sing, dance, chant and pray at the feet of Ganesh statues, then submerge them in water. The festival was once used to circumvent British rule. Revelers in Mumbai hoist up a statue of the elephant-headed god Ganesh and parade it toward the Arabian Sea. 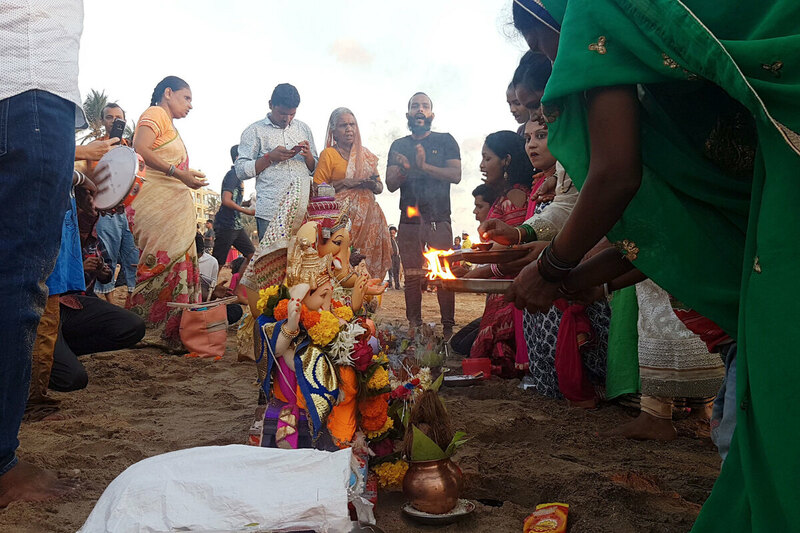 Families buy a Ganesh idol for the occasion, and pray over it at home, before processing toward the beach. Neighborhoods get together to erect temporary stages called pandals, on which they place giant Ganesh statues, and hold block parties around them. The Ganpati festival, as it's also known, is celebrated all over India, with faithful immersing idols in lakes, streams, even man-made ponds dug out for the occasion. 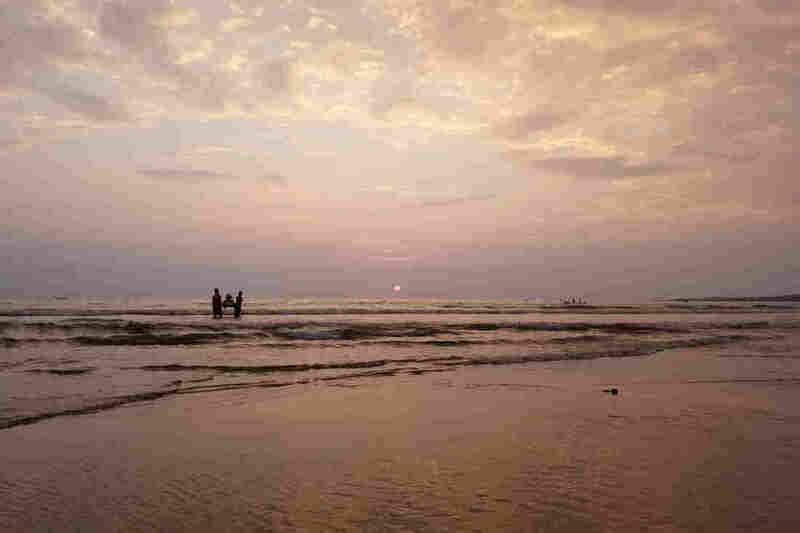 But Mumbai's Arabian Sea coast is where it's celebrated most fervently. 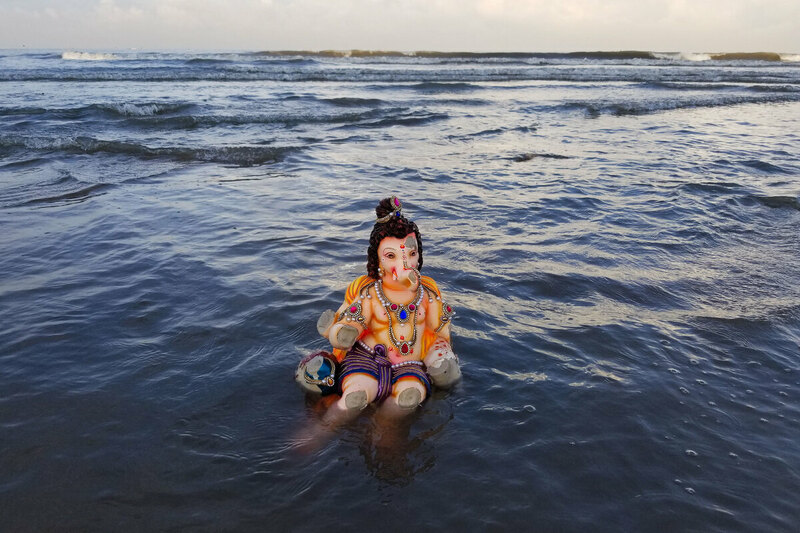 The Ganpati festival is celebrated all over India, with faithful immersing idols in lakes, streams, even man-made ponds dug out for the occasion. But Mumbai is its epicenter. "We have a lot of faith. We have seen the time from where, you know, we used to not spend so much. The celebration was limited," says Amruta Savant, 33, celebrating with her uncles and children. "But every year, we have prosperity, and we are getting our wishes fulfilled. So the faith goes on increasing." She places her idol in the sand and surrounds him with offerings — coconuts and strings of marigolds. She lights incense, while her relatives sing praise to Ganesh. Then one by one, they kneel down before the idol and whisper their wishes into the statue's ears. Lifeguards man the beach at all hours, as faithful young and old wade into the waves, usually at night. They believe when Lord Ganesha is submerged, he goes straight to heaven. "We dip him three times, and the third time, we leave him in the water," Savant explains. "It'll melt in the sea itself." Faithful place their idols in the sand, light incense and make offerings to Lord Ganesha, before carrying the statues down to the water to immerse them. Many of the idols are now biodegradable, so they don't wash up later, or pollute marine life. But some are still made from plaster of Paris, which does not disintegrate. Cleanup workers arrive with trucks the next morning to haul water-worn statues away. In Mumbai's largest slum, idols adorn a warren of impeccably clean little shacks. A local company, Reality Tours, takes tourists around, pointing out variations in different Ganesh statues and explaining the history. Ganesh has been worshipped by Hindus for centuries. But this festival really took off after 1893, as a clever ruse by a freedom fighter. 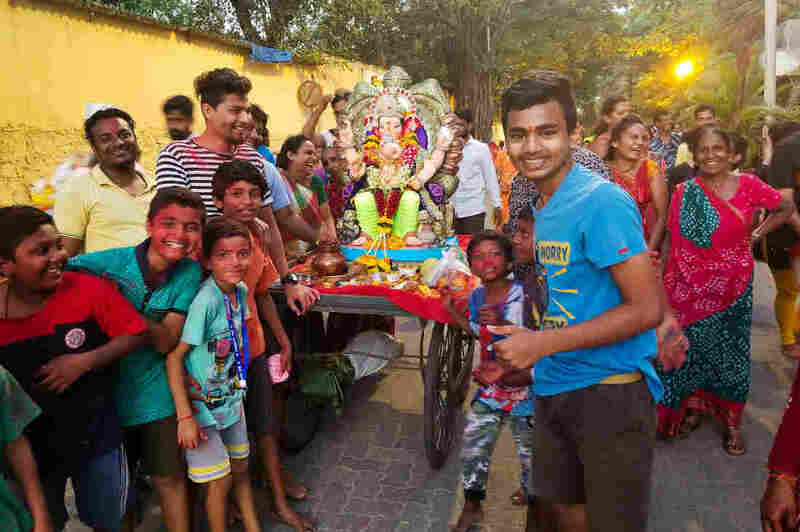 Neighborhoods get together to erect temporary stages called pandals, on which they place giant Ganesh statues, and hold block parties around them. When India was under British rule, curfews were often imposed to prevent independence-minded Indians from gathering for demonstrations or political meetings. Public gatherings were banned — except for religious ones. So in 1893, the Indian freedom fighter Lokamanya Bal Gangadhar Tilak came up with a plot: He told the British that it was an important 10-day religious festival, that required people to gather in the streets and on the beaches, around Ganesh idols. "He was a social reformer and also [an] Indian scholar, and he came up with this idea to mislead the British," says tour guide Suraj Hattarkal. "It was a trick, to bring the whole community together, and share revolutionary things." India became independent from Britain on Aug. 15, 1947. Worshippers believe when Lord Ganesha is submerged, he goes straight to heaven. Nowadays, the festival is a massive party. There are processions, dancing and drumming. People hand out treats in the crowd. Ganesh specialties include modak, a type of sweet dumpling filled with shredded coconut, and laddus, bite-size spheres made from purified butter, flour, sugar and dried fruit. "Everybody shares. We have food for 200 to 300 people!" says Ashish Tivari, a 22-year-old medical student celebrating with his neighbors. Among them was 8-year-old Vinayak, who grabbed this visiting reporter's microphone. "I am also his neighbor!" the boy squealed. Ganesh "is a god — our god." Did he make a wish? Of course, he says, but it's a secret. 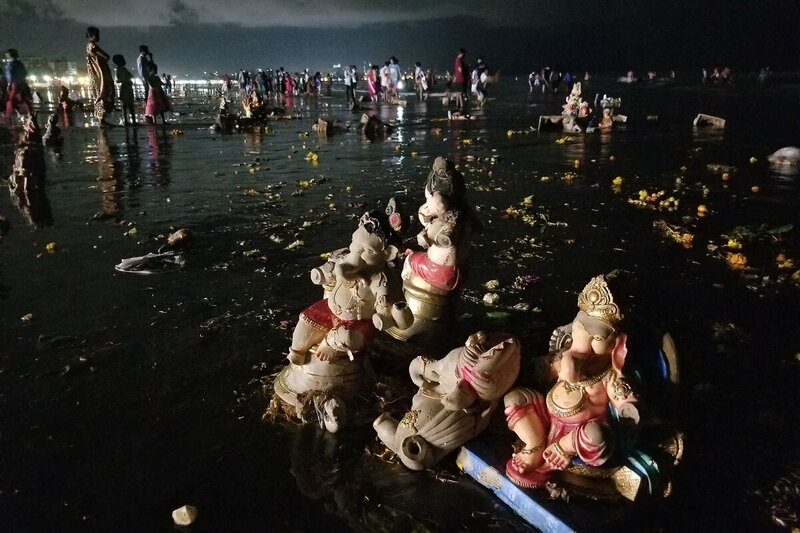 One of the chants you hear, as people bid farewell to Ganesh, waist-deep in water, is: "May we see you again next year." Cleanup workers arrive with trucks the next morning to haul away the remnants of the water-worn statues.